The Change School Week 3: POSSIBILITIES - PAVE YOUR PATH HOW will you make your mark? Discover your career possibilities based on the impact you want to make. Week 3: POSSIBILITIES - PAVE YOUR PATH HOW will you make your mark? Discover your career possibilities based on the impact you want to make. Continuing from our Bold Career Primer Bootcamp this post covers what we discover in...Week 3: POSSIBILITIES - PAVE YOUR PATH HOW will you make your mark? Discover your career possibilities based on the impact you want to make. Welcome Back to those who joined us last week as we covered the topic of crafting your career narrative. Today’s mini-training will give you some key questions and practical tips you can do this week to get you started on track. It’s about bringing INTENTION back to your career pursuits, understanding there will be some TRADE-OFFS if you want to focus on what really matters, and being OK and OWNING what you truly desire - a life and career that enables you to reach your personal and professional goals. We often undermine or overlook our greatest strengths when we haven’t had the opportunity to apply them in our work environment. Your strengths include: areas you’ve studied, been trained in, or have had experience in through internships, college assignments, side projects, or the things your friends and family come to you for. It also includes your best traits: for example having tenacity, the ability to motivate people, being someone that people feel they can easily trust. Make A List - Brainstorm all the skills you currently have (and ever learned/developed) This includes your natural abilities (singing), trained skills (financial accounting), strengths (personality traits or responsibilities you have been recognised or praised about), activities/responsibilities you enjoy to do, and your personality traits. Analyse - Review everything you’ve written and circle the ones that you enjoy to do, or excel at, or want to do more of. As an option, you can also give a ‘grade’ (keep it simple - 1, 2, or 3) to indicate your level of experience/competency for each item. Ask Someone - Choose 5 people who know you well (idealy - a family member, friend, co-worker, boss, and professional contact) and ask them for an honest sharing of what they think your Top 3 strengths are. Remember to give them some context! >> Inside our 6-week course our Personal/Professional Profile Assessment will help you along with our coaching. As Grace has shared, there’s alot of INNER WORK involved in any type of change - especially a career transition and exploration phase. All too often, we’ve seen people in career transitions losing valuable time and motivation because they’re not actively searching or seeking opportunities. Inaction breeds a vicious cycle of more inaction and less and less motivation. You need a MULTI-PRONGED STRATEGY & APPROACH to your career exploration, and you need to PUT YOURSELF out there. It will be uncomfortable; but if you’re serious about your bold career move, it’s time to get comfortable with being uncomfortable … and you’re gonna need some courage to go with that! We all need SMALL WINS and the only way to get them is to GO AND GET THEM. MEET People - You’ll never achieve your bold career dreams from your desk or computer screen. You need to be making new connections, asking key questions, telling your story, and creating opportunities for serendipity to happen. SOCIALISE On+Offline - Last week we taught you how to craft and tell a compelling story. Now it’s time to tell it! You already know the power of social media; the question are you using to your advantage for your career transition? If not, get out or online - with a clear intention. It’s easy to waste time when you don’t have a purpose. Identifying your career possibilities that are best suited to you depends on your ability to find the alignment point of What you have (your career “assets”) + What the market needs (what they value and are willing to pay for) + What ignites you (your interests, passions, abilities). Who do you want to help/serve? What problem do you want to solve (e.g. a cause, business challenge, or social issue)? How could you apply what you have to contribute to the solution? How do you want to make an impact/positive difference? What are things you really don’t want to do? Your Financial standing (e.g. runway, appetite for risk, basic costs), Your Expectations (e.g. what are you willing to give up, how much, for how long), and Your Priorities (e.g. salary, seniority, experience, etc). We’ll also be talking more about How To Financially Manage Your Career Transition in our free webinars about de-risking your career change - more on that to be announced in the coming weeks so watch this space! The greatest pitfall when it comes to exploring your career possibilities is limiting your prospects from the get-go by making assumptions about what is / isn’t possible and getting in your own way instead of casting a wider net first, and then filtering your ideas based on a key set of criteria that will help you to evaluate your options and make the best possible decision for your next career step. Enjoy the process. There’s no certainty in anything. When you keep an open mind, focus on the possibilities, and have access to the right guidance, structures and support systems to help you move forward. Today’s mini training hopefully gave you a solid starting point, 5 helpful strategies and 3 concrete actions you can take to start discovering your career POSSIBILITIES. REMEMBER IT IS A PROCESS and THERE’s NO SUCH THING AS INSTANT GRATIFICATION. We know CAREER EXPLORATION phase is where most people want personalised inputs + feedback + support. Exploration and evaluation of your possible career directions/trajectories … AND decision making! 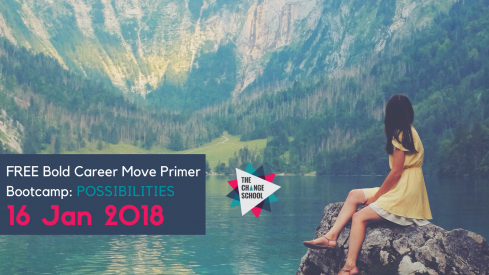 So it could even be a 60-day ACTION PLAN for exploring and trialing a range of possible career opportunities before making your BIG BOLD MOVE. Carving your path; How to craft a powerful career statement; How to change your story; What are your career assets; WHAT IS YOUR VALUE; How to package it together on your LinkedIn profile, professional documents and in interviews. Over to you Grace to share all our LINKS!! !